Findings from NACUBO’s 2016 National Profile of Higher Education Chief Business Officers signal the need to develop the next generation of CBOs—as well as more formal succession plans—to facilitate that transition at many institutions. Even more prevalent than in NACUBO’s previous national survey of CBOs in 2013, the 2016 National Profile of Higher Education Chief Business Officers finds a high percentage of CBOs (nearly 44 percent) indicating that their next professional step is retirement. In 2013, that number was 40 percent. Yet, 37 percent of CBOs report that no succession plan is in place for their soon-to-be-open positions. Further, 49 percent believe that there is only an informal succession plan in place at their institutions. 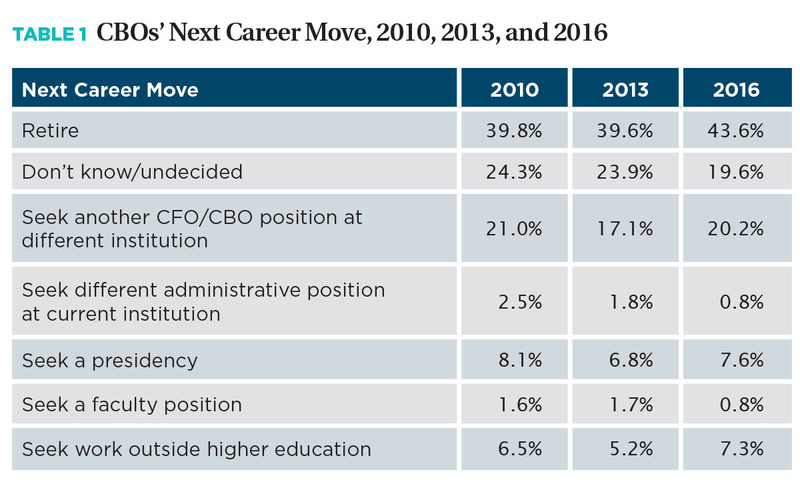 Interestingly, 20 percent of CBOs indicated that their next expected career move was seeking another CFO/CBO position at a different institution (see Table 1). Very few (only 7.6 percent) plan to seek presidency at a higher education institution in the future. Most cite lack of interest in the work or not having a terminal degree as their reasons. Given these trends and lack of formal succession planning, the career path for those desiring future CBO positions seems somewhat uncertain. In a series of interviews with Business Officer magazine, higher education business office professionals at various stages in their careers offered their perspectives on how these trends have shaped their views of the current and future workplace environments at their institutions. 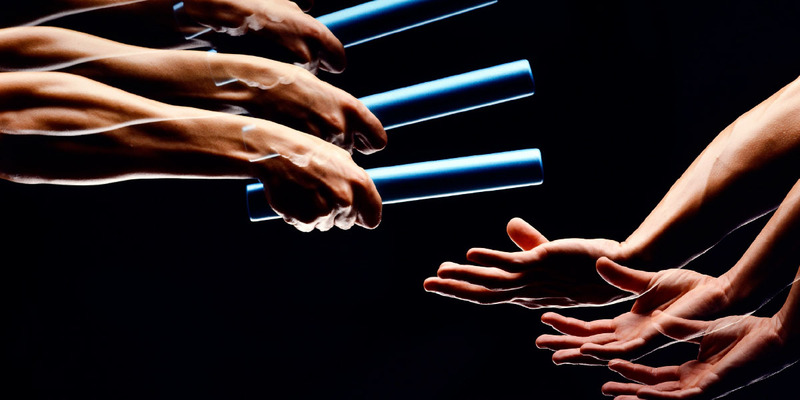 Even as they gain their footing at their institutions, new chief business officers have a unique perspective on succession planning. Often they are not internal hires and may have come from fields outside higher education. For example, now in his third year as vice president of administration and finance at the College of Central Florida, F. Joseph Mazur III didn’t expect to pursue a career in higher education. “I thought that I would be working for a CPA firm or a corporation,” Mazur says. “After my initial hire, I thought this might be a viable career path of working toward a bigger cause of helping the community,” Mazur continues. “I went back to public accounting for a year, but I had more job satisfaction working in higher ed.” Before coming to Central Florida, Mazur most recently served as dean of finance at Indian River State College, Fort Pierce, Fla. He began his tenure there in 2006 and further refined his career goals. “My former boss and I had a great relationship,” Mazur notes. “We discussed succession planning. CBO was ultimately the role that I envisioned myself in, but I knew that I needed to build my resume and experience.” With that in mind, Mazur obtained a master’s degree and the CPA designation, which he says enabled him to bring this additional skill set to Indian River and allowed him to be seen as a trusted adviser. 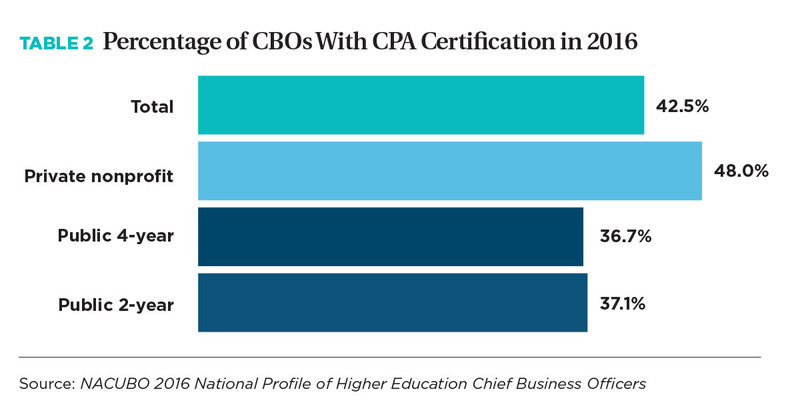 The survey indicates that a small percentage of CBOs have CPA certifications (see Table 2). Dave Duryea, vice president for finance and management at SUNY Cortland, also feels supported in his approach to the CBO role. A retired U.S. Navy rear admiral, Duryea came to the institution just a year ago when he replaced a longtime employee who had passed away. According to Duryea, his predecessor had intended to retire from the position. “From my perspective, the strength that I brought to an institution where there hasn’t been a lot of turnover in senior leadership was the outside perspective of someone not from a higher ed background who could ask why we’re doing things a certain way,” Duryea explains. “This doesn’t always go over well, but my president is very supportive of my asking those questions. “I was a career military officer, and it was time to do something else,” he continues. “The mission of the military was never about the individual but the nation, and I was looking to join another organization with a greater good mission.” To accomplish this goal, Duryea reached out to a network of family and friends, who were retired or active university presidents, as well as other retired military members in senior leadership positions in higher education. NACUBO’s survey findings reveal that while a small percentage of CBO hires come from a military background, the largest number coming from outside of postsecondary education hail from business and industry fields (see Table 3). Mazur has already had five staff retire during this tenure and expects more to come in the near future. “Several people on my team are in the advanced stages of their careers,” he says. “Fortunately, they are proactive and thinking about their departments beyond themselves.” Of those positions left vacant by retirements, one was filled internally while the rest were replaced through external hires. Even though CBOs can’t handpick their successors, opportunities for professional development and advancement are key to the future of the profession, asserts Mary Lou Merkt, vice president of finance and administration at Furman University, Greenville, S.C. “Succession planning is all about leadership training. We need a detailed plan to get everyone at Furman with potential up the ladder if they choose to go that route,” says Merkt, who has held her position for 13 years and is also the past president of the Southern Association of College and University Business Officers and the chair-elect for 2017–18 of the NACUBO board of directors. Knowing that she has opportunities for growth has influenced Kim Salisbury’s decision to remain at the University of Idaho (UI), Moscow, for almost five years. “There are lots of benefits to being here,” she says. “One of them is that they encourage us to be involved in professional development.” Salisbury joined the university’s business office as an accountant and was promoted to academic budget officer earlier this year. During her tenure at the university, she obtained her certified management accountant designation and also attended NACUBO’s Future Business Officer Program in 2014. “I look for professional development programs that will benefit me in the future,” Salisbury says. “For instance, I will be attending a conference on academic program costing that will be helpful in my current role. “In the FBO program, we talked a lot about mentoring,” she continues. “I keep in contact with one of the presenters I met there. One of my goals for attending conferences is to create a network that I can rely on now and in the future.” Salisbury acknowledges that she’s really in the beginning stages of preparing for the CBO role, but she plans to keep in contact with others on the same career path, while continuing to show her current institution that she’s willing to take steps toward that career goal. Staci Sleigh-Layman, executive director of human resources at Central Washington University, Ellensburg, Wash., knows all too well that staff sometimes leave to pursue opportunities at other institutions. CWU’s chief business officer left earlier this year, and the university appointed an interim chief financial officer and vice president for business and financial affairs. From Sleigh-Layman’s perspective, filling these positions presents an opportunity to think about succession planning. At CWU since 1984, and in HR since 2009, Sleigh-Layman doesn’t recall ever getting a promotion without going through a national search. “I’ve been promoted at CWU via two national searches. I take great pride in that. There’s credibility that comes from competing for positions,” she says. “CWU’s job is to prepare internal candidates to compete nationally for positions.” She believes that the preparation is a shared responsibility. “It’s important for the university, over an employee’s tenure, to provide opportunities for growth and development. But it’s also up to the individual to do career planning, ferret out experiences that can be useful, and take advantage of available opportunities. “You don’t get extra points for just being at CWU,” she continues. “You get points for having the experience and having done the work.” To that end, Sleigh-Layman believes higher education institutions have the responsibility to invest in the profession by making professional development readily available to staff. “It’s up to the organization to ensure that opportunities are made available to those individuals who want to do more and work toward professional goals,” she says. “We have to invest in people, knowing that at any given time they might leave. “We owe something to the profession,” she emphasizes. “We’re not just planning for our own succession; we’re planning for someone else’s as well. If we can’t provide that growth opportunity, another institution might be able to.” Given CWU’s location just two hours east of Seattle in a city with a population of about 19,000 (9,000 of whom are students), Sleigh-Layman recognizes that the institution, which has 1,500 permanent full-time employees, doesn’t have the same flexibility in filling positions that an urban center might have. Admittedly, this is a small step, but it’s a start. “Our goal is to plant the seeds that get people excited about their prospects and looking for professional development opportunities,” Sleigh-Layman says. “We have to educate employees and their supervisors so that they can make their relationships fruitful for the institution.” If those relationships blossom, hopefully institutions will have a clearer idea of who’s next in line for leadership roles in the business office. I wanted to learn how the position of CBO is changing,” says Corey S. Bradford, senior vice president of business affairs at Prairie View A&M University, Prairie View, Texas. Bradford served on NACUBO’s CBO Profile Committee and participated in developing the questions and methodology for this year’s survey. Warren Madden, chief business officer, retires this year, after 50 years at Iowa State University, Ames. Most chief business officers can’t imagine spending 50 years at the same institution, but Warren Madden wouldn’t have had it any other way. 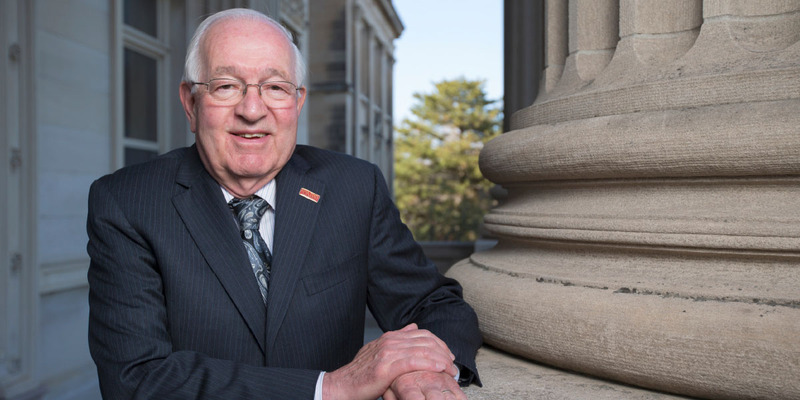 He retired this year after working at Iowa State University, Ames, since 1966, serving as chief business officer since 1984. Madden is past president of the Central Association of College and University Business Officers. He chaired the business affairs council of the National Association of State Universities and Land-Grant Colleges, and served on the board of directors for the Council of Governmental Relations. In 1993, he received NACUBO’s Distinguished Business Officer Award. Through years of adapting to the management styles of five different Iowa State presidents, Madden also learned to adapt his own management style to best meet the needs of the current workforce. “People generally say that they like my style of being engaging and accessible and not looking over everyone’s shoulder,” he explains. “However, it’s different today than it was when I first started. I have had to adjust my management style. In summing up his career, Madden says, “For me, this has been a great experience. I don’t look back and regret staying here so long.” He and his wife, who is a former food science and human nutrition professor and career services director, plan to remain in Ames and continue volunteering at the university and in the community. The 2016 National Profile of Higher Education Chief Business Officers is based on survey responses received from 713 chief business and financial officers at U.S. higher education institutions. The survey examines the CBOs’ personal characteristics and educational attainment levels; career paths they took to get to their current positions; areas of responsibility and skill sets needed to perform their jobs; levels of job satisfaction and areas of job frustration; and future career goals. This year’s study also includes new information on CBOs’ salary levels and succession planning activities. The 2016 CBO National Profile project is generously supported by TIAA. The final report (NC9001) is freely available on NACUBO’s website in the Research section. To learn more about the findings of the report, listen to the NACUBO In Brief podcast episode, which can be found on the NACUBO website on the “NACUBO Podcasts” page.